I was at the thrift shop the other day and bought this VERY cute summer blouse - it fits me perfectly and has the best little details. It also has a peplum, which I just LOVE. Well, I started to wear it and something about it just didn't seem quite right. I walked around the house in it for awhile, but there was just something about it that bugged me. I finally figured it out: it was the collar. It was just too big and floppy to suit me. Oh no! Now what to do? The blouse was so perfect otherwise! And, I paid $3.99 for it at the thrift shop, a premium price. Well, it hit me - I could ditch the collar altogether, which I proceeded to do. 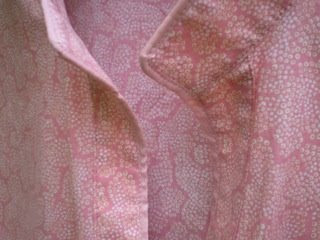 Now the blouse is absolutely just right. 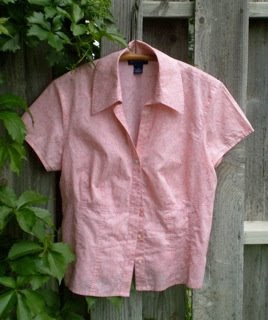 Here is the blouse with the collar cut off. 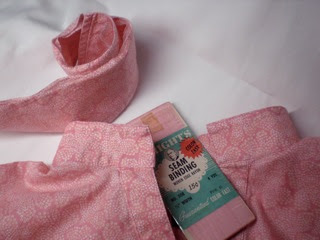 I used this vintage seam binding to finish off the cut edges. I have to say, it does pay to be a packrat! 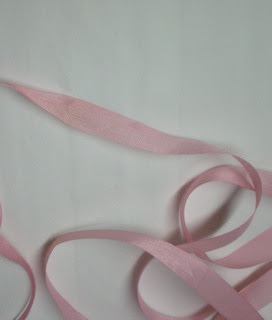 Isn't this the most beautiful ribbon? It's really easy to use. Just remember it has no stretch at all, so you will have to ease it a little bit around the corners. The next thing I did was add the binding starting from the right bottom front, all the way around and ending at the left bottom front. 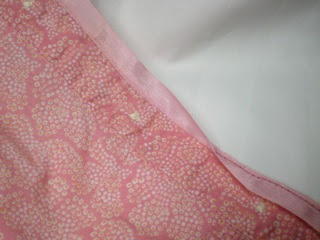 I sewed the binding on the INSIDE of the blouse. 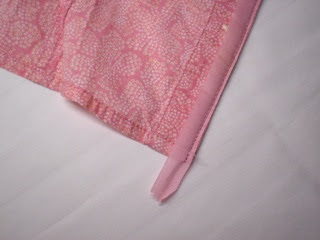 Then I pressed the binding towards the edge of the fabric. After that I wrapped it around to the front and sewed it down. If you have trouble with the buttons making your lines wavy, try using a zipper foot for the button edge. 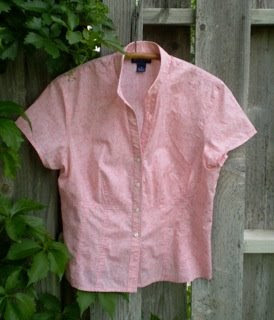 Here's the same blouse without the collar. Much more to my liking! Here's a close-up detail where you can see the bound edges. Now I can't wait to wear my new blouse! Very good "tutorial"! The blouse turned so great and it was such a good idea to remove the collar. It made me feel like going to the thrift store and look for some treasures myself.